It’s kinda of crazy to see and think about what’s behind your walls. It’s funny to talk with people and they don’t understand where the water goes when it goes down the drain. Some people don’t realize all the work that goes into a house before the sheet rock and nice paintings get hung. 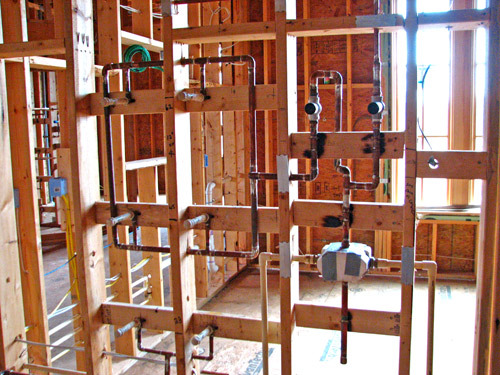 Here’s a picture of a house with rough in plumbing. So much time and thought goes into planning the layout of each and every room. What you see in the picture above is water and drain lines. The placement of where pipes go is very crucial. Also, in the bottom left hand corner you’ll see wires that run through each truss. When running water and drain lines make sure to put in nail plates at every truss. Having the chances of the sheet rockers putting a whole in a pipe is just not worth it. Take the proper steps in building or don’t build at all. Hire the professionals so the job gets completed right the first time around.